I was the first female councillor in Xàbia Town Hall. The year was 1983 and our democracy had just begun, achieved at a cost of many years and much suffering. Everything was new and the treasure that we had in our hands had to be nurtured with care and with effort. We were building the future; my little joke. Today, more than thirty years later my convictions are intact. 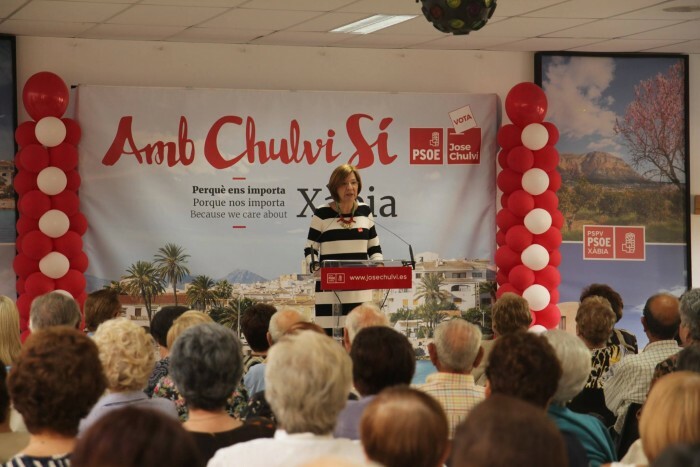 And my strength too, because I have found in the candidate list of the Xàbia PSOE, in the person of José Chulvi, the confidence to believe in good politics, focused on the wellbeing of the people and caring for what we are, it makes more sense than ever. Are we all equal? If you wish, you can make comparisons. In these four years, the programme of the Xàbia socialists has been more than 95% achieved and despite having a budget of 8 million Euros less than in the previous year we were able to increase the resources allocated to social services and develop work opportunities. We have a mayor who did not receive a centimo of salary from Xàbia Town Hall, and the money saved was used to protect those most vulnerable in the town. We have opened the doors and windows of the administration to make it transparent, ethical and participatory. Even now politics are different, as opposed to the past situation where the government was used as an arbitrary one-sided tool, but with José Chulvi not only our government partners but the opposition councillors have participated in important decision-making, in addition to our citizens through participatory councils. Moreover, we have changed the direction of the economy of our town. We have pushed out the speculators from our territory, to focus on another type of public works: small town improvements, those which make daily life easier for our fellow citizens. These help Xàbia companies and Xàbia people and enable us to have a town which is increasingly friendly and open. The proof of what I’m saying is the new bus station, the renovation of public areas, 40 kilometres of roads resurfaced, the opening up of the Via Augusta, the Port library, the Central Cinema, the wind-mills, the lime kilns, the riurau, improved street lighting, renovation of avenues … and the commitment to create the Montañar walkway during the next legislature. All these improvements comply with the values and model of our town. Think back to previous governments and other politicians who when they talked about public works in Xàbia were prepared to squander our heritage to do business with their “best friends”. Look at a ghost urbanisation which I won’t name, and then look at the improvements in the suburbs. That’s the difference I’m talking about. Nothing more and nothing less than this is at stake on May 24th. Don’t let anyone try to sell you future solutions which are just a return to the excesses of the past. The Xàbia Socialists are not all the same, because we have a strong tradition of values and we have not strayed from them. Not an inch. We are what we are, and we want to remain so with you. So I ask you to vote for José Chulvi as mayor of Xàbia. We deserve to continue in a positive way! Isabel Bolufer, number 2 on the candidate list of the Xàbia PSOE.